A story of change and recovery on Midway Atoll National Wildlife Refuge, a novel environment. Located at the far end of the extensive Northwestern Hawaiian Islands, Midway Atoll National Wildlife Refuge (NWR) is one of the most remote atolls in the world—more than 1,500 miles north-west from Honolulu, Hawai’i. Home to the world’s largest albatross colony (and more than 20 other migratory and breeding seabirds and shorebirds), Midway evokes the idea of an isolated, pristine environment. However, after decades of dredging, building, digging, moving, and bulldozing, Midway is far from it—making wildlife conservation, habitat restoration, and invasive species control both challenging and rewarding. Gazing out over the open field during a morning plant survey, I see thousands of albatross. Nearly equally spaced apart, a patchwork of Black-footed (Phoebastria nigripes) and Laysan Albatrosses (Phoebastria immutabilis) sit patiently, quietly, carpeting the island. Some doze off, bills tucked deep into their soft, warm feathers, and others peruse the landscape, sometimes shifting in their shallow nest cups and give a couple of slow clap claps with their bills. It is the start of the breeding season on Midway Atoll National Wildlife Refuge. Only two months ago, the albatross started to pour in; at first, a few appeared here and there across the otherwise empty island. Soon thereafter the island was a waving sea of black and white and the air was filled with whinnies, screams, rapid-fire bill claps, and moo’s—through all of the day and all of the night. After a (likely) lonely existence at sea, the albatross eagerly checked out one another, then madly sparred over nesting spots, and later danced, courted, and cavorted deep into the night. But now, most of the commotion has calmed down and given way to the hushed incubation period. For the next 60 days or so, each expecting albatross pair will patiently incubate their egg, the males and females rotating through 2-week shifts. From the nest, they look out over the dunes, fields, forests, and varied landscape of Midway. The warm, honey smell of Sweet Alyssum (Lobularia maritima) wafts up as I walk along the field, a scent so reminiscent of this place and the onset of winter that it has imprinted on my mind as much as the nesting albatross. And yet, this widespread, low-growing herb is not native to Midway (instead, it is native to Southern Europe and the Mediterranean). How did it get here? Although it has been observed on Midway since 1941, it is one of the many—in fact, one of the hundreds—of introduced plants on this remote atoll. Interestingly enough, looking southwards over the island, I see nothing but non-native and invasive plants. As the Refuge’s Invasive Plant Control Specialist, the concept of restoration seems like an impossible task. Described as an “oasis of green in a blue desert,” Midway’s landscape is—quite simply—one that is highly modified, an amalgamation of different eras, starting with the construction of the United States’ telegraph cable across the Pacific Ocean in the early 20th century. Over time, the physical shape and extent of the atoll’s islands as well as the plant communities evolved (by mechanical means rather than natural processes), giving way to one novel environment after another—that collectively define this atoll’s layered landscape. Change began with the more “permanent” settlement of people on Midway. From 1906 through 1930, nearly 9,000 tons of topsoil were imported from Honolulu and Guam—and in the process, introduced unknown amounts of soil organisms, insects, and (perhaps the most damaging) weeds. In fact, since the start of botanical surveys in the early 20th century, more than 400 different plant species have been found on Midway Atoll NWR (far beyond the 15-25 different native plant species found in the Northwestern Hawaiian Islands). In comparison to the first botanical survey by William A. Bryan in 1902 (who found only 13 species on Midway—all native), the most recent survey in 2015 (by Forest and Kim Starr) documented 199 species, of which 86% (172) are non-native! Instead of open, sandy islands with small shrubs, flowing bunchgrasses, and vines along beaches, Midway resembled—at times—a small slice of Oʻahu, a paradise brimming with Coconut Palms (Cocos nucifera), forests of Ironwoods (Casuarina equisetifolia), and verdant gardens. Photos: (left) Sand Island of Midway Atoll, circa 1940 (photo credit: The American Warrior/John R. Bruning): (right) Sand Island, decades later, in 2014 with an expanded harbor, developed largely after World War II (photo credit: Google Earth). Midway Atoll’s terrestrial habitat (three islands) collectively covers 621.6 hectares; Sand Island (pictured) is 486 hectares in size based on 2015 measures. What’s the problem with this approximate Eden and Midway’s many non-natives? Exotic plants might be valued by human inhabitants for aesthetic purposes or to provide certain crops; indeed, myriad plant species have been introduced all over the world for various reasons. But, they can also completely disrupt and degrade habitat needed for wildlife—especially so on seabird colony with 3 million birds packed into 2.4 square miles. So, in this sea of invasive plants, how do we pick and choose what to suppress, what to contain, and what to eradicate? Which ones pose the greatest threat to imperiled wildlife species that the Refuge seeks to protect and conserve? For these criminal plants, the Refuge has employed a strategy of “seek and destroy,” a no-tolerance tactic to keep the weeds at bay and (with the help of native plant propagation efforts) aid the recovery of the atoll to a robust and resilient seabird colony. During my plant surveys, as I walk transects along the Sweet Alyssum, I am on the lookout for a particularly nasty invasive plant. Surprisingly enough, sometimes it can be hard to find. On my transects, I search for a showy plant with brilliant yellow flowers: Golden Crownbeard (Verbesina encelioides), one of the most invasive weeds across the atoll. By the late 1990s, this plant blanketed the majority of Midway Atoll’s three islands—upwards of 60% of land cover. An aggressive species, Golden Crownbeard proved extremely challenging to control. Growing as thick as a cornfield, Golden Crownbeard can quickly reach heights of 7 feet or more, creating serious issues for the surface-nesting seabirds: albatross. Its rapid and widespread infestation reduced seabird nesting density, reproductive success, albatross chick survival, as well as native plant biodiversity and recruitment. When albatross parents came to take over shifts for one another (during incubation or to feed their ever-hungry chick) it was nearly impossible for them to find their mate or chick in a labyrinth of Golden Crownbeard. The height and density of this weed also cut down on wind circulation. One would have thought that with the extra “shade” this would have provided for some potentially quality shelter on a blistering day. But without a breeze, many albatross chicks perished. Over the years, the Refuge tried numerous tactics to suppress Golden Crownbeard, including large-scale mechanical means such as mowing. Imagine it—attempting to navigate lawnmowers through a sandy and bumpy landscape, skidding around snapping albatross, and avoiding burrow-nesting Wedge-tailed Shearwaters (Ardenna pacificus) and Bonin Petrels (Pterodroma hypoleuca). Various concoctions of herbicides were also tested and applied on the Golden Crownbeard. It was not until several years ago, when the push for eradication was set to full throttle via a grant from the National Fish and Wildlife Foundation, that a more effective mixture was developed, a blend of glyphosphate and Milestone (a pre- and post-emergence control herbicide), which not only killed the Golden Crownbeard, but ensured that any seeds produced would be hindered from sprouting (and was safe for use in close proximity to wildlife). Now, after years of an aggressive regime of focused treatment and thousands of hours put in by volunteers, contractors, and Refuge staff, Golden Crownbeard is down to only 1% land cover across the atoll. This last percent will likely be the greatest challenge in eradicating this species—but certainly the most important percent. Complete eradication requires ongoing monitoring and control, but success is in sight. Where nesting sites were once completely overrun by a thick carpet of yellow flowers, incubating albatross have returned. Albatross nesting density, as well as reproductive success, has also increased among albatross demography plots—a testament to the change in the landscape and the move towards a more native (and less non-native) dominated atoll. Additionally, buffered by mass outplantings of stout Kāwelu (Eragrostis variabilis), ʻĀweoweo (Chenopodium oahuense), Pōpolo (Solanum nelsonii), and other native species, the idea is that these plants will take advantage of the open landscape (and slightly less competitive environment) and continue the process of island recovery. With Golden Crownbeard under control and on track towards total eradication, the future is looking bright on Midway—or is that the light peeking through now that this weed is nearly gone? 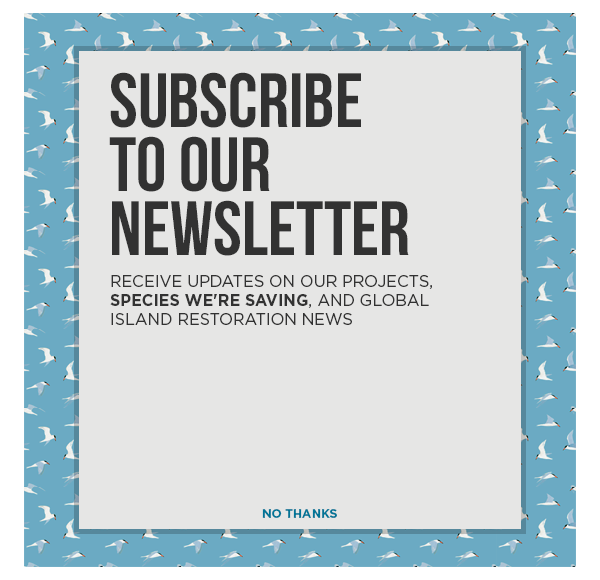 Midway Atoll NWR is committed to eradicating damaging invasive species to aid with island restoration and ecosystem recovery across the atoll. Quality habitat of native plants is critical to the long-term success and sustainability of the myriad species that occur here—and invasive plant management is a key part of that. Invasive plant management is a meticulous process, but recovery is possible—even in a highly modified environment such as Midway Atoll NWR. And as for the other +150 non-native plants on our Refuge Plant List… you’re next. Wieteke Holthuijzen is the Invasive Plant Control Specialist on Midway Atoll National Wildlife Refuge, helping to restore the atoll to a bustling seabird colony. Wieteke received her BSc in Environmental Science and minors in Wildlife Resources and French at the University of Idaho. She is intrigued by the nexus of nature and human presence and seeks to study and contribute to the conservation of imperiled species. In her spare time, she enjoys learning how to play the banjo, electric bass, and ukulele.